The College of Education is celebrating its 50th anniversary this year. Five decades, seven deans, thousands of teachers and countless students have been touched by excellence in action at the K-State College of Education. From humble beginnings – two of the first seven graduates from Kansas State Agricultural College became educators to today’s distinction of being the largest teacher preparation program in Kansas – the college continues to forge new paths and develop relevant programming. “Connections” magazine will be published later this fall and promises to offer a fascinating look at college – both then and now. 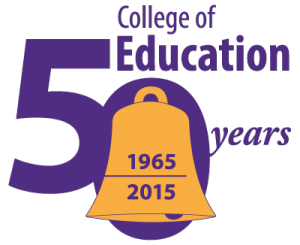 Congratulations to the College of Education for 50 years of teaching, research, and service. I am proud to say I was a faculty member for 27 years of those years (1983-2010). I had the privilege of working alongside intelligent, hard-working, and fun colleagues. I taught many bright students who had good work habits and were highly motivated. I am grateful to the faculty mentors and past administrators who helped me succeed. Thank you to all! Thanks for your many contributions! Our college is overflowing with amazing faculty, staff and students. Stay in touch!